Trained by the Royal Shakespeare Company to revere the text because after all, "the play's the thing," Ben Kingsley might not be much of an improviser but the man can do accents better than almost anyone. And thankfully for Backstabbing for Beginners, Kingsley (and his delicious Greek accent) manages to distract us from what is essentially a paint-by-numbers political corruption flick that could've only benefited from creative improvisation or outside-the-box thinking by its screenwriters. 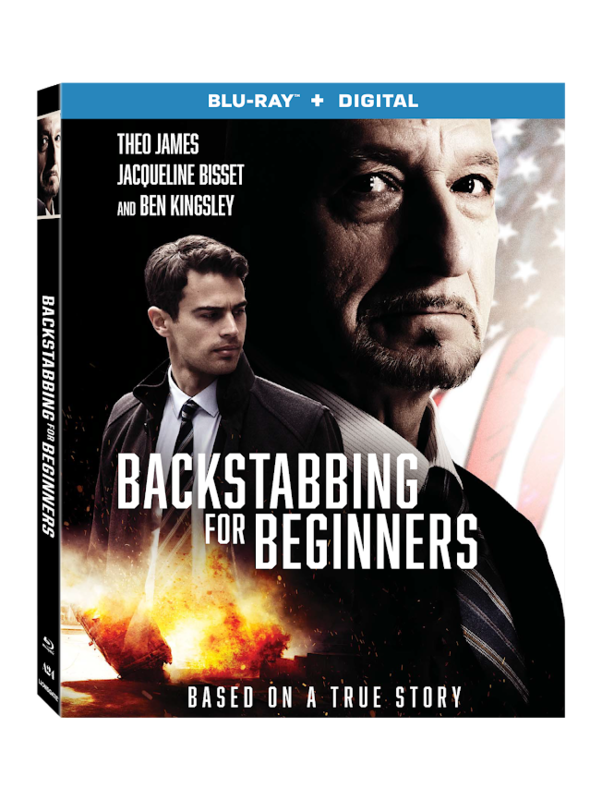 Working off of government whistleblower Michael Soussan's explosive memoir of the same name, the American filmmaking debut of acclaimed Danish helmer Per Fly might claim to be based on a true story but in true Hollywood fashion, Backstabbing for Beginners is merely inspired by real events. 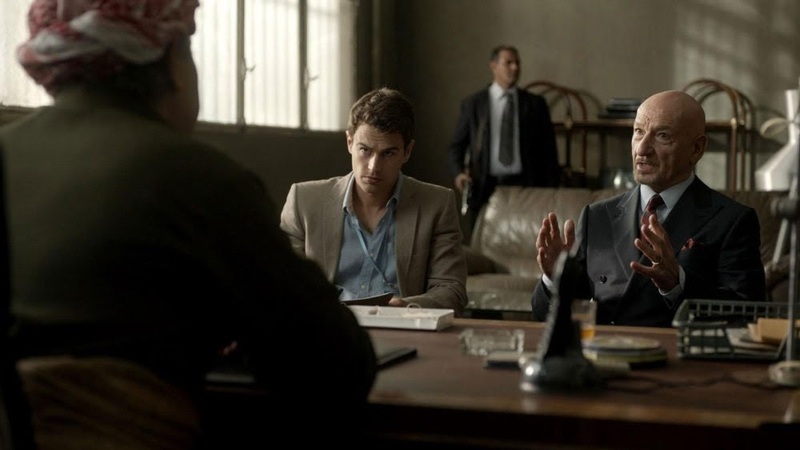 Seemingly bored by the material, Divergent star Theo James sleepwalks through his role as twenty-four year old UN diplomat, Michael Sullivan. On his fourth try applying to follow in his late father's footsteps and serve his country, Michael is appointed the Special Assistant to Kingsley's Undersecretary General. In charge of feeding and providing medicine for a nation of twenty million Iraqi people, Kingsley's charismatic yet enigmatic Pasha runs the Oil for Food program with a questionable set of rules and justifications all his own. The largest humanitarian program in UN history, the Oil for Food program was also a hotbed of corruption. And before he's long in his post, the CIA warns Michael about the kickbacks between leaders as well as the mysterious death of his predecessor in a scene reminiscent of The Firm. Using standard genre tactics like cardboard character types we're not sure our lead can trust, we're quickly introduced to the film's obligatory potential love interest, Nashim (nicely played by actress Belçim Bilgin). A beautiful political activist with inscrutable motives, Nashim opens Michael's eyes to the bribery and fraud all around him. Unfortunately there's zero chemistry between Bilgin and James or really anyone and James. Filling in for Hunger Games actor Josh Hutcherson after he pulled out due to valid concerns for location safety – considering that Fly was planning to shoot in Jordan and therefore had no locations planned for its eventual substitute Morocco – James seems like he'd rather be anywhere than here. Although Backstabbing manages to pick up momentum for its relatively exciting third act, the bulk of picture doesn't offer conspiracy thriller fans much they haven't seen before. Unsure whether it wants to be a talky cautionary tale about governmental and corporate corruption or an ethical thriller with plenty of action and intrigue, it settles on very little of either (despite Fly's intentions as described in a behind-the-scenes Blu-ray extra). Released straight to disc and digital, ultimately the whole production feels slapdash and routine. An uneven effort from Fly and co-scripter Daniel Pyne, Pyne has had much more success in previous genre collaborations from the Tom Clancy adaptation of The Sum of All Fears to The Manchurian Candidate remake, both of which fare much better than this one. And though it might work on the level of a slightly above average made-for-cable movie, as a feature in its own right, not even Kingsley's masterfully accented and frequently flippant use of the F-word is enough to recommend Beginners. Text ©2018, Film Intuition, LLC; All Rights Reserved. http://www.filmintuition.com Unauthorized Reproduction or Publication Elsewhere is Strictly Prohibited and in violation of the Digital Millennium Copyright Act. FTC Disclosure: Per standard professional practice, I may have received a review copy or screener link of this title in order to voluntarily decide to evaluate it for my readers, which had no impact whatsoever on whether or not it received a favorable or unfavorable critique.